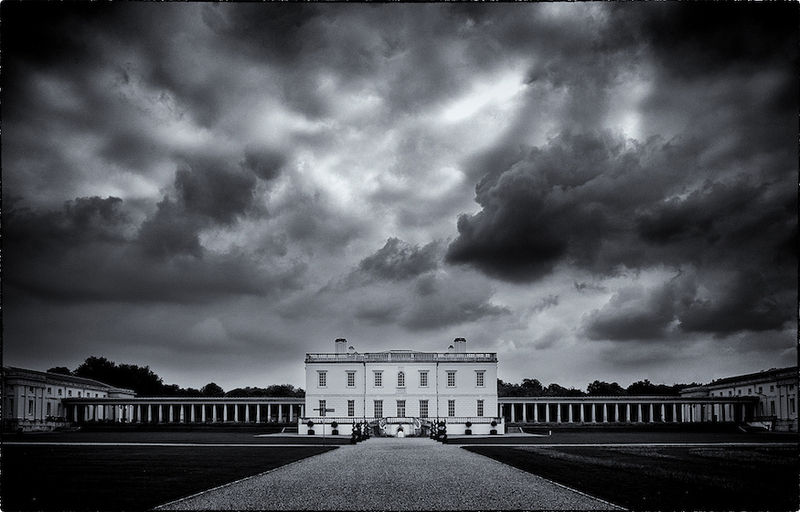 Nigel Bewley captures the drama of the Queen's House, Greenwich. Photo from the Londonist Flickr pool. 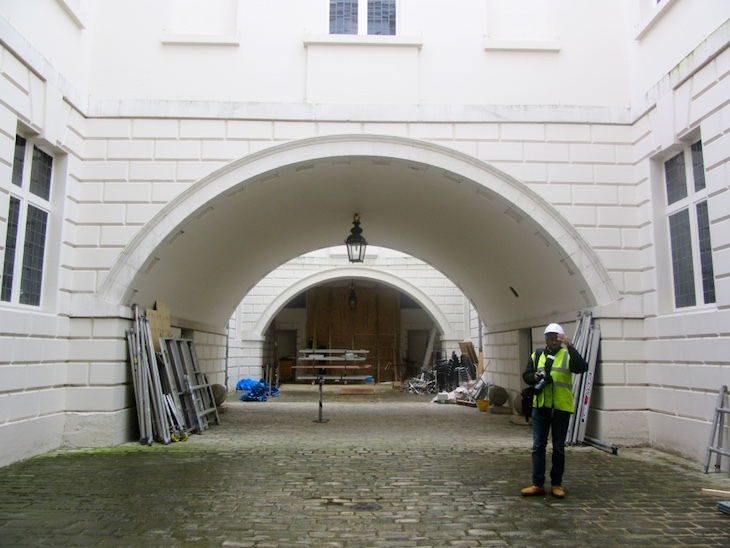 While the Queen's House at Greenwich was having a makeover recently, we donned our hard hats and went along to have a nosey behind the scenes. Here are a few things we found out about this intriguing building. 1. It's the first Classical building in England... or is it? Nowadays, the Queen's House doesn't look at all unusual. But imagine it in the middle of Hampton Court Palace and you'll have some idea of what it must have looked like to 17th century eyes. As curator Christine Riding remarks, "it landed like a Classical spaceship on a Tudor site", an avant-garde beacon of white a century ahead of the popularisation of the Palladian style in Georgian England. However, although the building of the Queen's House started in 1616 — three years before the commencement of another Inigo Jones-designed building, Banqueting House at Whitehall — it wasn't finished until 1635, 13 years after the completion of Banqueting House. Most of Greenwich Palace, or the Palace of Placentia, fell into disrepair during the civil war and although Charles II had dreams of rebuilding it after his restoration, money and interest was lacking and only one new wing was built, now part of the King Charles Court at the Old Royal Naval College. So we've got that, and the Queen's House. 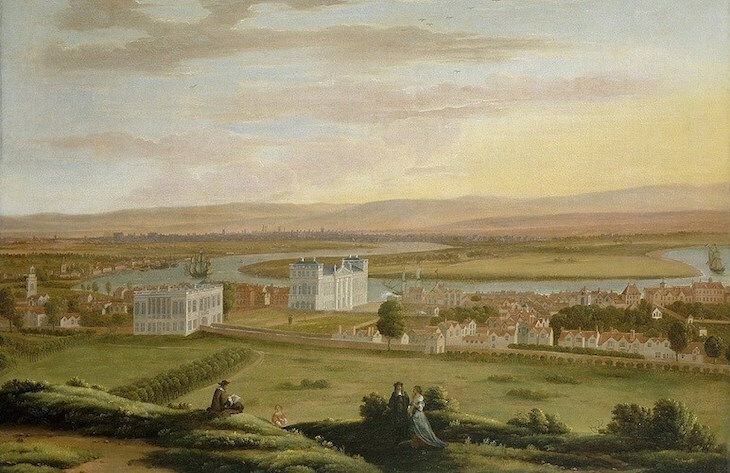 A View of Greenwich and the Queen's House from the South East by Hendrick Dankerts, 1675, courtesy of the National Maritime Museum. Two queens presided over this royal villa: James I's wife, Anne of Denmark, and Charles I's wife, Henrietta Maria of France. Though it was commissioned as a gift for Anne, she didn't really get to enjoy it, what with dying three years later when not even the ground floor was complete. Work was only resumed in 1629 when James's son Charles I gave it to his wife, Henrietta Maria of France, who at least got a good eight years use out of it before the civil war, the execution of her husband and her own flight into exile. She did get it back after the Restoration of 1660, though. Inigo Jones was a prolific architect, but a lot of what he created or modified has sadly disappeared over the years. Building-wise, what we have left are the Banqueting Hall at Whitehall, the Queen's Chapel at St James's Palace, St Paul's Church at Covent Garden, and of course the Queen's House — Jones's first building. We also have Jones to thank for the reconstruction of Somerset House, for Covent Garden Piazza and possibly for Linsey House at Lincoln's Inn Fields. The original building was just the central bit, the perfect cube of the Great Hall but not the east and west bridge rooms — these were added later by Charles II. And the covered walkways fanning out to connect the house to the other buildings? Also a later addition, this time from when the Queen's House had become part of the naval school. The footpath that was part of the Woolwich to Deptford thoroughfare, going right through the middle of the Queen's House. The Great Hall is to the right. Photo by Rachel Stoplar. Imagine if the Strand ran straight through the middle of Buckingham Palace. That's what it was like at the Queen's House, built on top of the important Woolwich to Deptford thoroughfare that connected the two royal docks, and hence why the bridge rooms are named as such. When the current restoration is complete in July, you too will be able to walk under it. Christopher Wren's distinctive double wing design for the ORNC wasn't just a curious whim. When the great architect was working on the new building, Queen Mary requested that the unobstructed view from the Queen's House to the Thames was preserved. When royalty requests, one tends to oblige, hence the gap. Interestingly, this view was only possible once the rest of Greenwich Palace was gone — now, the view itself is part of the Queen's House status as a Scheduled Monument, a position it shares with the likes of Stonehenge and Canterbury Cathedral. The Queen's House visible straight through the middle of the two wings of the Old Royal Naval College. Photo by Martin Baker from the Londonist Flickr pool. Henrietta Maria had Tuscan painter Orazio Gentileschi do the ceiling of the Queen's House's Great Hall, but then decided to give it to her favourite confidante, Sarah Churchill, Duchess of Marlborough, because she was a queen and could do that sort of thing. It was shipped off to Marlborough House, but the ceiling space there was smaller so a significant portion of the painting had to be lopped off to fit. Now that the building is undergoing restoration for the first time since the 30s, Turner-prize winner Richard Wright has been commissioned to redo the ceiling. He'll be working with a bevy of apprentices and a whole lot of gilt, drawing a cartoon on paper that will be transferred to the ceiling's surface by 'pouncing' ('piercing cartoon holes and running chalk through'). The Queen's House iconic Tulip Stairs aren't just very pretty — they're the first geometric self-supporting spiral stairs in Britain. The particular shade of blue paint that coated this wrought-iron structure is made of crushed glass. The restoration team are recreating this sharp hue using the same method. 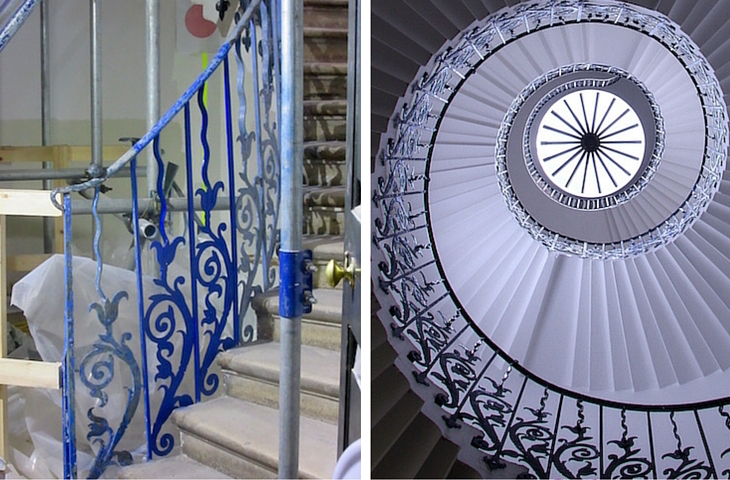 Left: the stairs being restored with glass-based blue paint. Photo by Rachel Stoplar. Right: the Tulip Stairs in all their glory. Photo by missusdoubleyou from the Londonist Flickr pool. Though the Queen's House started life as a royal villa, it's changed roles many times since the 17th century. Under Charles II it was a grace-and-favour spot, a place to put royal friends like the first Astronomer Royal, who used one room as a study, and for artists who used other rooms as a studio. 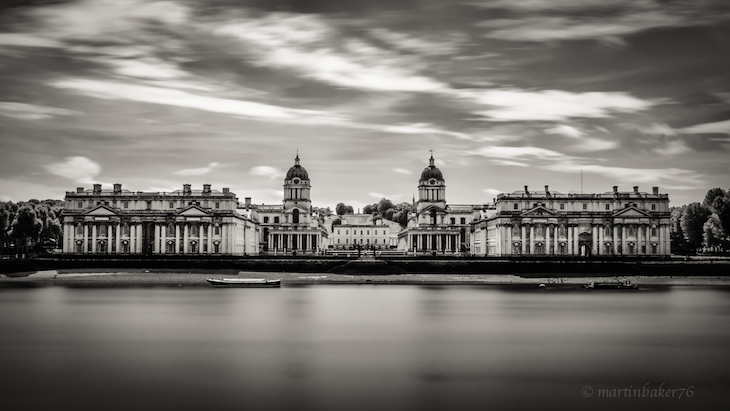 In 1692 it became the Royal Hospital for Seamen at Greenwich on the instructions of Mary II, moved by a scene of wounded sailors, with the historic meaning of a 'hospital' as a hospitable place, rather than a medical one. In 1714, the house became the official home of Greenwich Park's ranger, before later becoming a part of the Royal Naval College, when there were bunks in the King's Presence Chamber and a fully rigged training ship in front of the Great Hall — visible on Ordnance Survey maps from the time. Since 1934 it has housed an art gallery as part of the National Maritime Museum. Now it's been restored — with a return to the "princely magnificence" from when it was a royal villa, and elements that speak to the various points in the building's past.